Hezbollah chief Hassan Nasrallah >says of Jews: “If they all gather in Israel, it will save us the trouble of going after them worldwide”. Hamas is committed by charter to “struggle against the Jews” until the “obliteration” of the State of Israel. That tweet did the rounds, and elicited more than a whiff of anti-Semitism. Jeremy Corbyn is not only a patron of the Palestine Solidarity Campaign: he supports the BDS agenda. What manner of peace-making diplomat supports sanctions against one party after hearing the grievances only of the other? Why invite Islamists to tea on the House of Commons terrace, but not extremist Zionists? Indeed, why invite members of Sinn Féin to Parliament but not representatives of the UVF, UDA or LVF? He invited Dyab Abou Jahjah and shared a platform with the Belgian radical. Abou Jahjah called the killing of British soldiers in Iraq “a victory” and the 9/11 terrorist atrocities “sweet revenge”. He says Europe has adopted “the cult of the Holocaust and Jew-worshiping its alternative religion”, and in response to the Danish Mohammed cartoons he called on Arabs to spray paint walls across Europe with “hoax gas-chambers built in Hollywood in 1946 with Steven Spielberg’s approval stamp, and Aids spreading fagots”. Jeremy Corbyn is not an anti-Semite. How I wish that he were. How much easier it would make things. We could chalk all this up to the prejudices of one man and we could avoid the raw, awkward conversation we’re about to have. Because this isn’t about Jeremy Corbyn; he’s just a symptom and a symbol. The Left, and not just the fringes, has an anti-Semitism problem. Contrary to left-wing mythology, anti-Jewish prejudice has never been the exclusive preserve of aristocratic snobs or skinhead fantasists. “The Jew is the enemy of the human race,” declared Proudhon. “One must send this race back to Asia or exterminate it.” Bakunin labelled Jews “bloodsucking people” while Orwell, self-consciously anti-Semitic, even obsessed over the excessive number of Jews sheltering in London’s Underground during World War II. (No matter what the Jews do to protect themselves, it’s always disproportionate.) Marx, the grandson of a rabbi, essayed: ”Once society has succeeded in abolishing the empirical essence of Judaism – huckstering and its preconditions – the Jew will have become impossible”. The contemporary Left, in most cases, would recognise these statements as irrational prejudice. But what if we substituted “Zionist” for “Jew”, what would happen then? How many would object to “Zionists” being termed enemies of the human race? How many would be glad to see the “Zionist” become impossible? Anti-Zionism has removed much of the need for classical anti-Semitism by recycling the old superstitions as a political critique of the State of Israel. Why risk the ridicule that comes with quoting The Protocols of the Elders of Zion when you can cite The Israel Lobby and win eager nods from academics and commentators? Why deny the Holocaust when you can throw it back in the Jews’ faces by fictionalising Gaza as a concentration camp? Why hurl rocks at a Jew in the street when you can hurl endless vexatious UN resolutions at Israel? 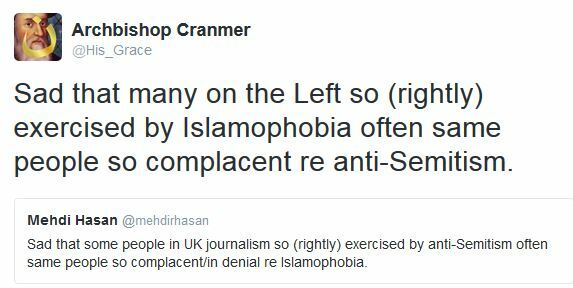 And so we arrive at vicarious anti-Semitism: Jew-hate by proxy. 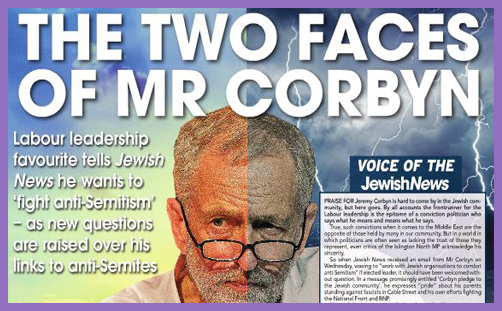 Jeremy Corbyn doesn’t hate Jews: he doesn’t need to. He despises and detests Israel, with its smug sense of superiority, aggressive imperialism, plundered wealth and gibbous nuclear capacity. He is for peace, boundless compassion and unfettered human rights: Israel is for war, endless oppression and totalitarian cruelty. There can be no fellowship of light with darkness, and no tea on the Commons’ terrace, either. The Left’s unhinged antipathy towards the State of Israel has let loose ugly sentiments wholly unmoored from such legitimate criticisms. Israel is execrated as uniquely malignant and its enemies held up as plucky freedom-fighters or victim-idols. Corbyn and his like sup with Hamas and Hezbollah, they say, because we must talk to all sides to resolve the conflict, even the extreme and unpleasant. It would never occur to them to invite representatives of the Jewish Defence League to Parliament or to count Baruch Marzel or Michael Ben-Ari as “friends”. There is indeed a storm brewing, but it isn’t clear at all that ‘the Left’ is morally equipped to deal with it. They perpetually misread the forecasts and batten down the wrong hatches. If, as Jeremy Corbyn insists, “We all have a duty to oppose any kind of racism wherever it raises its head, in whatever form it raises its head”, then “We” must begin with him, and “any kind of racism” must extend to guests invited to Parliament and journals deemed worthy of being granted an interview. He might even deign to share a platform..